Public affairs professionals who manage stakeholder engagement, legislative tracking, or grassroots advocacy. 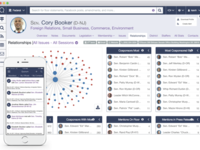 Quorum is software built for public affairs, providing one place for stakeholder engagement, legislative tracking, and grassroots advocacy. 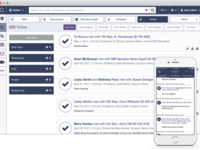 Quorum was founded in 2014 so public affairs professionals could have modern software built for them. Headquartered in Washington, D.C. Quorum's software is used by thousands of public affairs professionals for their work in Washington, Brussels, all 50 states, and thousands of cities across the U.S.
Pros: I like the ability to quickly create lists of members based on criteria such as committee or caucus memberships, sponsors/cosponsors of legislation of interest, etc. I also like the fact that we can create custom fields to track members' positions on key issues. Cons: It has so much functionality that it's a bit disorganized. I would also like to see custom bios improved. Overall: When asked by colleagues which platform I would choose if I could only have one, I recommend Quorum. 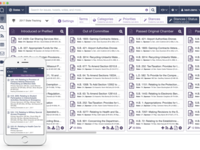 It's a one-stop shop for legislative tracking, contacts management, developing advocacy target lists, and more. 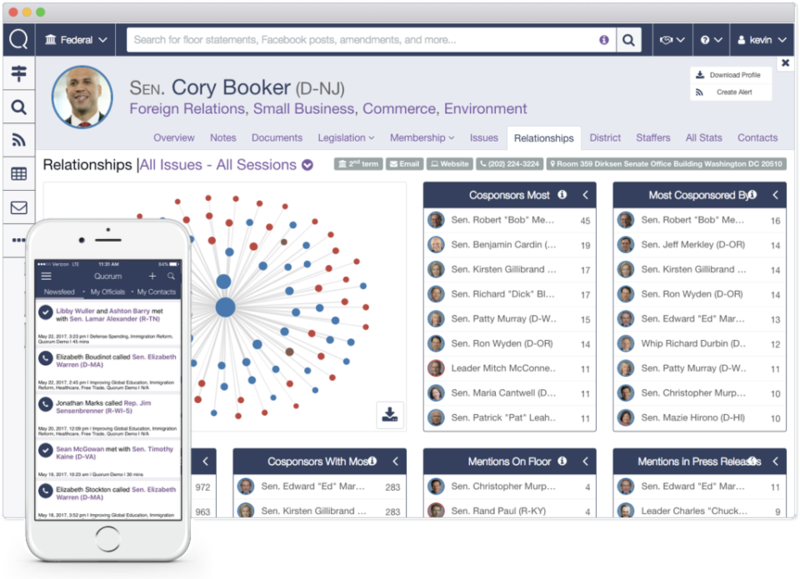 Pros: Quorum is a feature-rich government relations and legislative/regulatory tracking platform that has helped our federal affairs team to improve our outreach, track legislation, and map our engagement and impact. Quorum's tools, particularly its issue tracking and sheets features, have given us the opportunity to have a bird's eye view and the ability to go granular across the wide variety of issued we track. Quorum is first in class for state legislative tracking, too. Cons: Quorum's rich feature set took some getting used to, and they were very helpful in resolving these initial challenges through a strong customer service offering. Thank you for providing your feedback on our product and customer service. It's wonderful to hear the issue management and sheets features are helpful to the work you do! Pros: The Sanofi SGR Team comments about the bill tracking and daily updates. The system also runs great reports for internal use. Cons: Sometimes, I can't remember how to add or delete a function. But customer services will always jump on a call or webex to assist. Overall: The Sanofi SGR Team would highly recommend this product to other state lobby teams. Every month they add more and more content to make our jobs in the state easier to navigate. If there is a new request, customer services is always willing to help their IT Department add that for our SGR Team. Our representative even comes to Team meetings. Thank you so much for recommending Quorum! We're glad to hear regular updates to the platform enhance your experience with Quorum State and that our support team has been able to assist when you've encountered challenges. Pros: There are so many different components that as long as you invest the time to learn the software, it can make your job so much easier and give you an incredible amount of data. 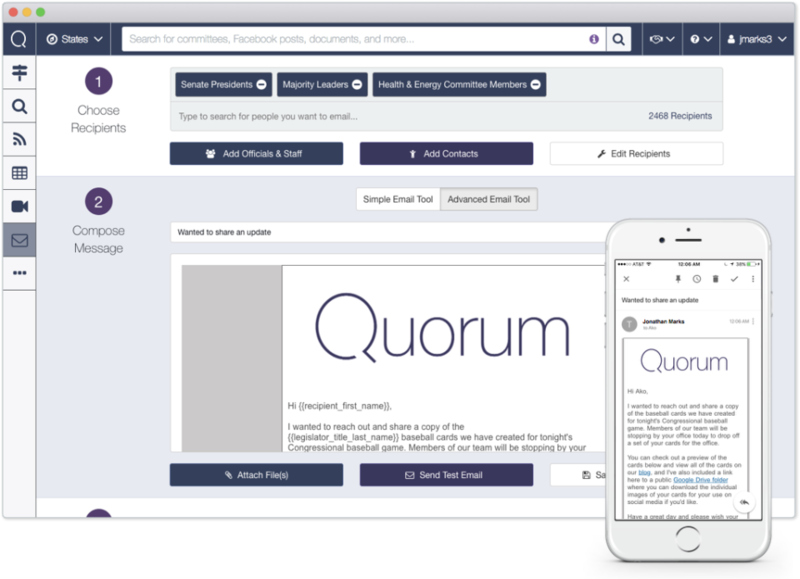 The Quorum team is also excellent to work with -- friendly, helpful and genuinely interested in feedback. Cons: It can take some time to become familiar and learn the features, but it's worth the investment. Thank you so much for sharing your thoughts and for making the investment in learning and making the most of Quorum! I couldn't do my job without Quorum! 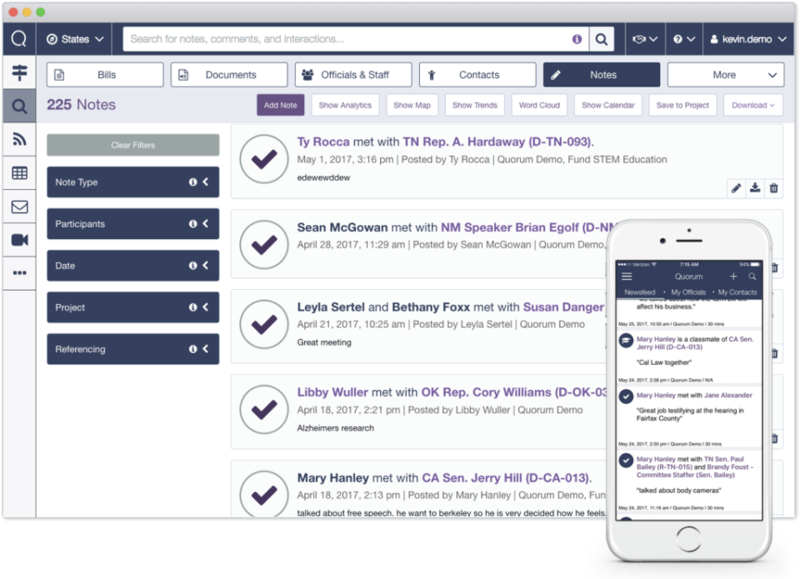 Pros: Easily integrates into each part of my advocacy work, from outreach to Congressional staff to organizing constituent outreach, Quorum helps make my day more productive. Cons: It can be difficult to navigate, not super intuitive. We're so glad to be able to contribute to your productivity! Thank you for the feedback about your experience as a user navigating the platform as we strive to make Quorum as easy to use as possible. Saves me hours of time every day! Reliable, thorough and easy to navigate. Pros: I enjoy the fact that the information is constantly being updated and that they are always innovating to ensure that the tools make our work easier and improve our deliverables to our clients. Cons: The functionality is superb, if I had to come up with a criticism I'd explore the color scheme and layout to allow for certain most often used functions to pop. Pros: I like the ease of use, the customer is fantastic and I like how it helps to make my teams' job a little easier. They have information at their fingertips with the app to look up staff members, notes, or touches to offices. We're so glad we can help make your team's job a little easier. Thanks for sharing your Quorum experience with the Capterra community! Pros: What I like most is the functionality of the software. I like the idea of being able to create individual projects, pull calendar of events and being able to send out mass communications.